Today the AP announced that software will write the majority of its earnings reports. But such reports hardly require humans anyway. 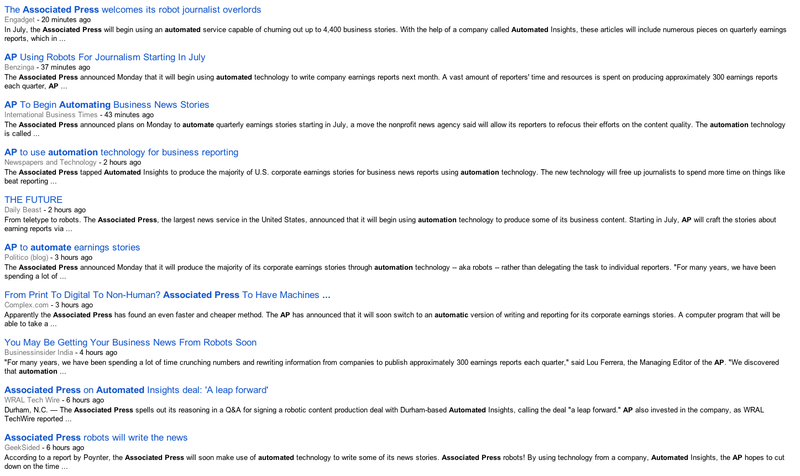 Earlier today, the Associated Press announced that the bulk of its corporate earnings stories will be, starting in July, written automatically. The new project is powered by a company called Automated Insights, whose algorithms will constantly trawl the servers of Zacks Investment Research for new earnings information and then publish stories about those figures in seconds. The efficiency of these algorithms is quite impressive: In 2013, Automated Insights published nearly 10 stories a second, according to a corporate blog post authored (ominously) by one Adam Smith. These stories were perfectly functional, even if they lacked stylistic inspiration. Analysts expect higher profit for Paychex when the company reports its fourth quarter results on Tuesday, July 1, 2014. The consensus estimate is calling for profit of 40 cents a share, reflecting a rise from 38 cents per share a year ago. The post is sufficiently human-seeming, but it’s not hard to imagine, as algorithms produce stories about different subjects, a movement of readers demanding clearer demarcations of algorithm-generated content, not unlike those who want to label genetically-modified foods. All this has naturally led to conversations about whether a computer can out-write a human reporter. When Wired reported on Narrative Science back in 2012, it quoted cofounder Kris Hammond as saying, “In 20 years, there will be no area in which Narrative Science doesn’t write stories.” Hammond also believes the algorithms will someday be capable of writing detail-heavy pieces of decent length. To journalists, these sorts of statements play neatly into the panicked “Robots are going to steal my job!” narrative that might well apply to the fate of other sectors of the economy. But is that the case here? These automated write-ups are for now filling micro-niches, such as Little League games or fantasy football drafts, that are outside the scope of information covered by journalists working now. As Automated Insights’ CEO Robbie Allen told Poynter, “We’re creating content where it didn’t exist before.” The AP's move has a similar underlying goal: It said that Automated Insights’ algorithms will allow them to produce nearly 15 times as many earnings reports per quarter than when they filed them manually. While, yes, it’s true that algorithms can cram stories about vastly different subjects into the same uncanny monotone—they can cover Little League like Major League Baseball, and World of Warcraft raids like firefights in Iraq—they’re really just another handy attempt at sifting through an onslaught of data. Automated Insights’ success goes hand-in-hand with the rise of Big Data, and it makes sense that the company’s algorithms currently do best when dealing in number-based topics like sports and stocks. On top of that, the earnings report as a journalistic form, which is what one might worry is endangered by the introduction of newsroom algorithms, is already robotically formulaic. The way the AP has been writing these reports up until now demands that human writers act like computer programs, copy-pasting the day's numbers into their predetermined slots. If algorithms that can write aren’t all that sinister, then it might be worth noting a trend that actually is harmful. The raft of articles today reporting on the AP’s announcement (which, to my knowledge, were written by humans) are practically indistinguishable, all digesting the AP’s press release to various degrees of incompleteness. Perhaps our fear—that it’s just a matter of time before a computer program tells us everything we need to know with inhuman flatness—should be channeled elsewhere, toward an industry whose economics encourage doing the same thing.